These deliciously moist pumpkin muffins are made with LIBBY’S 100% Pure Pumpkin, a Super Food. * And with LIBBY’S Pumpkin available year-round, you can enjoy these delicious and nutritious muffins any time of year. 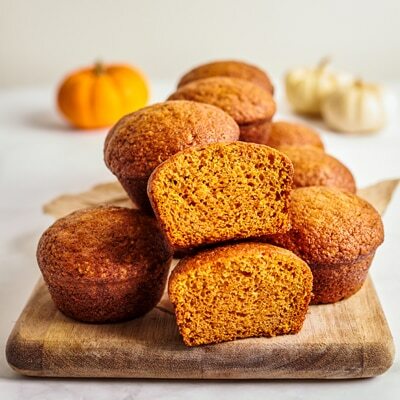 Whether you enjoy these delicious and nutritious muffins for breakfast or snack, you’re sure to take pleasure in the scrumptious pumpkin flavor and the natural richness of vitamin A. COMBINE flour, pumpkin pie spice, baking soda and salt in large bowl. Combine sugar, pumpkin, eggs, oil and juice in large mixer bowl; beat until just blended. Add flour mixture to pumpkin mixture; stir just until moistened. Spoon batter into prepared muffin cups, filling 3/4 full. BAKE for 25 to 30 minutes or until wooden pick inserted in centers comes out clean. Cool in pans on wire racks for 10 minutes; remove to wire racks to cool completely. Store muffins in covered container or resealable plastic bags. Note: *LIBBY’S 100% Pure Pumpkin is considered a Super Food as it is low in calories and fat and is a naturally rich source of fiber and Vitamin A (an antioxidant).